November 16, 2018 is the next 3rd Friday in Downtown Salisbury! This month’s theme is Holiday Lights, complete with the Holiday Tree Lighting Ceremony! It is also the last 3rd Friday held outdoors until Spring, so it’s time to stock up on locally made arts and crafts from 3rd Friday’s outdoor vendors for the gift-giving season! 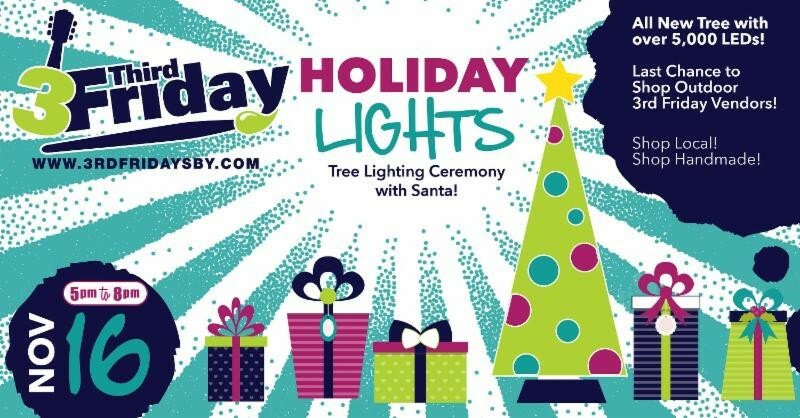 On North Division Street, check out the 2018 Holiday Tree Lighting Ceremony from 5:30 p.m. to 7 p.m., hosted by AMP Studios – with special performances by the Wilcox Family Band, the Major Minors, Pinehurst Elementary Choir, theTheatre Academy of Delmarva and Feet of Fire Dance! Enjoy caroling and singalongs before Santa arrives in time to light the tree at 6:30 p.m. After the tree is lit, everyone is invited to follow Santa over to First Shore Federal’s Winter Wonderland Lobby for cookies, candy and photo ops with Santa and Mrs. Claus! In anticipation of the Hanukkah season, the menorah will be displayed with the tree, fully lit, until Hanukkah begins on December 2nd when the daily lightings begin. The Downtown Salisbury Visitor Center will also be celebrating with a sold-out Gingerbread House Decorating event. On the Plaza, artists and crafters will line the street with local handmade items for sale. It’s the last outdoor 3rd Friday of the season, so it’s the perfect time to stock up on locally made treasures for the holiday gift giving season. The Bay Brass Ensemblewill perform holiday tunes on the plaza, and the Salisbury Jaycees will be serving festive libations. St. Peters Episcopal Church will hold their annual Fall Bazaar in Parish Hall, so stop by for lots of gift ideas, pies, baked goods, gift baskets, attic treasures, holiday decor and fun for activities for the kids, plus, oyster fritters, chili, burgers, and breakfast sandwiches – all indoors and out of the cold! In the Salisbury University Gallery Building, Salisbury Art Space will host a reception featuring the Working Artists Forum Pre-Holiday Art Show in the Main Gallery, with artist Jack Knight’s Amazing Grace Series of abstract paintings in the Foyer Gallery and portraits and landscapes by Barbara Kern-Bush in the Robinson Gallery. In the soon-to-be Salisbury University Entrepreneurship space, SU hosts current SU Entrepreneurship students and alumni presenting business plans, and promoting their own small businesses! Shoppers can check out Simply Salisbury, SU’s brand new gift and merch shop right on the Plaza, for 10% off right in time for the holidays! Its Prelude to Christmas at Barefoot Baby and Kids with special discounts on toys and Christmas pajamas up to size 6 – and free candy canes and a retro coloring page with each purchase. Plus, be sure to stop byDryden Dress Company as it celebrates itsTen-Year Anniversary and Holiday Open House – complete with refreshments and new arrivals! The downtown bars and restaurants are ready with live music for 3rd Friday! Roadie Joe’swill have live music with Smooth and Remy from 5:30 – 8:30 followed by DJ Outlaw from 10 p.m. until 2 p.m. Brew River Restaurant will have great dinner specials and live music by the Timmy Metz band from 7 p.m. to 11 p.m. Market Street Innhas an all new menu, plus DJ Juan late night, and Mojos has live band The Joshes!